I’m thrilled to tell you about a new collaborative book published by my friend Linda Joy and Inspired Living Publishing. Gratitude has a power that everyone, no matter her circumstances, can embrace. When we can ease into a state of gratitude within ourselves, regardless of what is happening around us, we make space for grace to take over―and that is when miracles start to happen! That’s why I am excited to share a powerful life-changing book with you. This brand new collection of 38 original stories prove the miraculous power of gratitude in our daily lives. Opening to Gratitude & Grace shares intimate, soul-powered narratives from thirty-eight women who have shifted their perceptions, strengthened their hearts, and found ease in their daily lives through the power of gratitude. These incredible stories prove that when we embrace gratitude in every moment, even when our current circumstances reflect something vastly different than what we desire, we invite grace into our lives. Allow these inspiring stories of healing and transformation to touch your heart and remind you of the power of gratitude. I am thrilled to support the authors in this inspiring book, many who are friends. 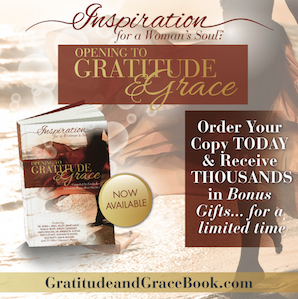 “I couldn’t put down Inspiration for a Woman’s Soul: Opening to Gratitude & Grace. I loved this book and I loved meeting all these courageous women. I laughed, I cried, I was deeply moved and profoundly inspired to bring even more grace and gratitude into my life.” – Dr. Margaret Paul, co-creator of Inner Bonding, coauthor of Do I Have To Give Up Me To Be Loved By You? and Healing Your Aloneness, and author of Inner Bonding and Do I Have To Give Up Me To Be Loved By God? P.S.S. Please consider sharing the love and spreading the message of #GratitudeandGrace with your social media families. It’s easy! Just copy and paste.